A part-time course to train the new generation of data scientists. course offers students a program that covers the concepts and tools you will need throughout the entire data science pipeline: asking the right questions; wrangling and cleaning data; generating hypothesis; making inferences; visualizing data; assessing solutions; and building data products. 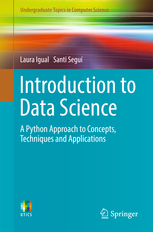 Parts of the presented materials in the postgraduate course of Data Science and Big Data from Universitat de Barcelona have been used in the recently published "Introduction to Data Science: A Python Approach to Concepts, Techniques and Applications" book. This book is accompanied by a set of IPython Notebooks containing all the codes necessary to solve the practical cases of the book. The Notebooks can be found on the following GitHub repository: https://github.com/DataScienceUB/introductiondatascience-python-book. Data science is about implementing actionable models by writing code and exploring data. Early stage registration (required) opened until July 1st, 2019. Acceptance notification July 10th, 2019. Official registration during July-September, 2019. The program is specially designed for students with a background in computer science, mathematics, and applied statistics, but other scientific and engineering backgrounds can be considered. We will require to follow lessons and complete class exercises using personal laptops. You will not be able to complete all your assignments in class if you rely solely on desktop equipment at home.